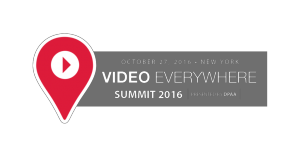 NEW YORK, October 18, 2016 – The 5thAnnual New York Digital Signage Week will bring together thousands of digital signage industry leaders and hundreds of out of home media owners, media planners, creative agencies, retailers, architects and investors, next week, October 24-28, 2016 for over 20 industry events. CHICAGO – October 6, 2016 – NEC Display Solutions of America, a leading provider of commercial LCD display and projector solutions, invites you to its annual New York Partner Showcase, featuring the latest visual technology solutions to meet business challenges, taking place on October 26 at SIR Stage 37, just minutes from Times Square and the Javits Center. NEW YORK, September 28, 2016 – As part of the promotional effort to increase awareness of NEW YORK DIGITAL SIGNAGE WEEK (Oct 24 – 28) the MTA will be running a series of video spots on its ‘On the Go Network’ of digital screens throughout the city. The campaign will run from October 1 through 28 in support of the week. 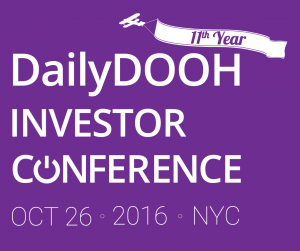 NEW YORK, September 22, 2016 – The DAILYDOOH Investor Conference, now in its 11th year, is a one-day networking event for investors and senior executives to meet and learn about the future of Digital Signage and Digital Out of Home…..
WARRENTON VA, September 20, 2016 – The Digital Signage Federation (DSF), the independent not-for-profit trade organization serving the digital signage industry, is pleased to announce that Jennifer Davis, Chief Marketing Officer, Vice President and Product Strategy at Planar Systems will participate as a panelist during Coffee & Controversy breakfast and tour organized by the DSF and Digital Signage Expo. ©2016 Ministry of New media Ltd.